Would you consider co-sleeping with your baby? These days it is not an evident choice to make. Some research indicates a higher risk for SIDS (sudden infant death syndrome) for co-sleeping babies, while other studies show exactly the opposite. And in the midst of these discussions, polls indicate that up to 70% of all parents do bring their babies and older children in their family bed. Why? Well, many babies, as well as older children, sleep a lot better if sleeping together with their parents. Many parents and especially new moms that feed at night also get substantially more sleep by keeping the baby in her own bed. But the risks are real and if you do decide to co-sleep with your baby, only do it after learning how to do it in a safe way. Below you’ll find a co-sleeping safety checklist. If you follow it, you’ll reduce the risks for your baby significantly. Also, remember to always consult your baby’s doctor if you are the least worried about the safety of your child. It may seem to you as if there is absolutely no risk that your newborn baby moves close enough to the edge to fall out of the bed. Don’t count on it. One day (or night) will be the first time your baby rolls over or makes some other type of movement. Place your baby either between you and your spouse or between you and the wall (or a piece of furniture). If there is space between the bed and the wall/furniture, fill it up with blankets or towels to eliminate any risk of the baby falling down. Also, consider tying the bed and furniture legs together to stop them from sliding apart during the night. Smoking is well documented to increase the risk of SIDS. Babies that are already at higher risk of SIDS due to their parents’ smoking habits hence should not co-sleep. Alcohol, drugs, and some medication make you sleep heavier and therefore put yourself at risk of harming your baby or not waking up fast enough. Sleeping close to you is warm and cozy for your baby. A warm blanket in addition to your body heat can actually be too much. Overheating is proven to increase the risk for SIDS. Therefore when co-sleeping the best you can do is to dress warm enough to sleep without a blanket. This way neither you nor baby will not become overheated and also will not be at risk of suffocation (by falling beneath a heavy blanket). If you breastfeed, invest in a good nursing top or two for sleeping, or use the one you had during the day instead of throwing it in the laundry. Also, wear trousers and socks if necessary. The one thing you shouldn’t wear is clothes with long loose strings since your baby can get tangled in them. All types of pillows and blankets are a potential risk for your baby, as they may land on top of the little infant and make it difficult for him or her to get enough oxygen. If it is hopeless for you to sleep without a pillow, at least use only one and make sure you keep your head on it. Also, make sure that the sheets are stretched and can’t be pulled loose. If your bed is very soft, including any type of water bed, don’t co-sleep with your baby. The risk is that your infant will roll over towards you, onto his belly. 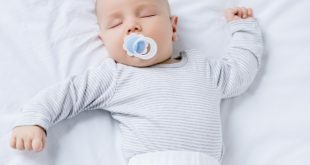 Belly-sleeping has shown to be a major factor for Sudden Infant Death Syndrome, especially among babies that are too young to be able to roll from stomach to back on their own. A relatively flat and firm mattress is needed. 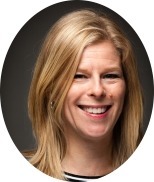 Consider your own (and your spouse’s) weight. If any of you are quite heavy, the risk increases that your baby will roll towards you and hence risk rolling over to belly sleeping without having the ability to roll back. Consider your own and your spouse’s sleep patterns. If any of you is a very heavy sleeper, maybe your baby should not share the bed with that person. Moms usually tend to wake up very easily and at any noise or movement by their baby, but there is no guarantee that this will happen to you. If you don’t wake up easily at night due to your baby’s sounds, it may not be safe for the two of you to sleep together. If your husband sleeps very heavily, it might be better to keep your baby between yourself and some piece of furniture or the wall rather than between the two of you (if possible). Older siblings should also not sleep in the family bed close to the infant. Keep the children on different sides of the adults. Older children (>2 years or so) can sleep together without any large risks. Only co-sleep with your baby if your bed is large enough to provide room for both of you. Ideally, you move away from your baby a bit during the night, both for safety reasons, to improve your sleep and to not make your baby completely dependent on your body contact for sleeping. If you think true co-sleeping may be too unsafe for your baby, you can always consider some kind of sidecar arrangement. Use a crib where you can pull down one side or even take it off and place the crib right next to your bed. Tie it to the main bed with some sort of cords. Another option is to use a snuggle nest or something similar. I tried that in the hospital when my baby was newborn and it was quite good. They are not very expensive and can be a great way to co-sleep with some added safety and comfort. For example, this bestseller at Amazon is a great option. (Opens in new window) The baby was placed in the nest beside me in my bed. Since the baby was slightly elevated and protected by the nest’s soft rails, there was really no risk that I would hurt him. I suspect, though, that these type of products only work well until the baby starts rolling over and moving around. On the other hand, by then they are at less risk of SIDS. So for safe co-sleeping during the first few months, a snuggle nest (or something similar) might be a really good idea. 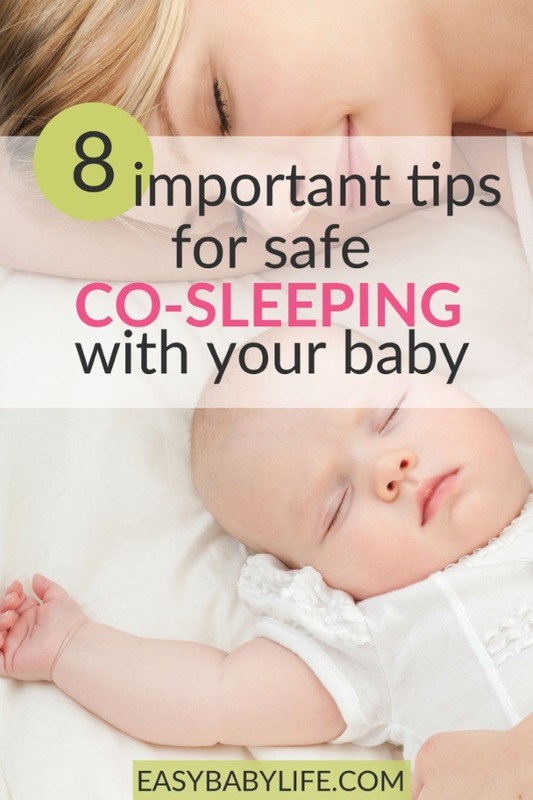 If you follow these tips, co-sleeping should be safe for your baby and probably much easier for you if you feed at night. How do you feel about co-sleeping? Please share your thoughts below.